On April 21, the Royal Canadian Mint unveiled their latest coin in tribute to the country’s Queen on the occasion of her 90th birthday. Queen Elizabeth II has been Canada’s head of state since 1952; she was born in London on April 21, 1926 in the London home of her maternal grandparents. She succeeded her father as the British and, consequently, Canadian monarch in February of 1952. In September of 2015, she gained the distinction of being the longest-serving monarch in British and/or Canadian history. 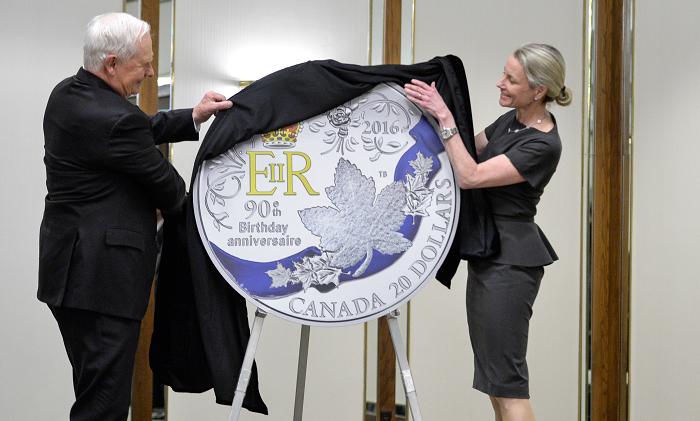 The Queen’s 90th birthday silver coin was unveiled today by His Excellency the Right Honourable David Johnston, Governor General of Canada and Royal Canadian Mint President and CEO Sandra Hanington before an assembly of the Monarchist League of Canada. The Queen resides in Great Britain and as such is represented in Canada by her governor-general, whose duty it is to act on her behalf in her absence. She has visited Canada no fewer than 26 times, more visits than any former Canadian head of state. During her stays in Canada her official residence is Rideau Hall in Ottawa, which serves as both the official residence of the Canadian monarch and the governor-general. 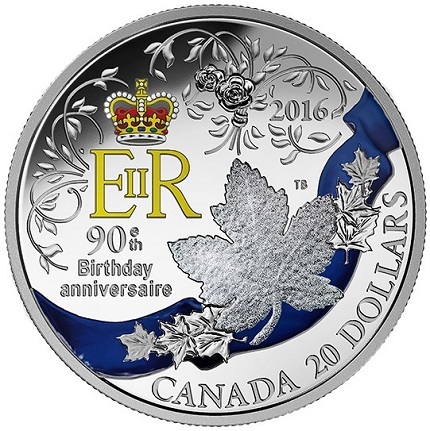 The reverse side of the coin is designed by Canadian artist Tony Bianco. It has been selectively enhanced with color to emphasize the Royal Cypher (EIIR), St. Edward’s Crown, and the garter sash, while a high-tech glittering effect makes the maple leaf brooch sparkle. The swirling pattern at the top of the design includes stylized Tudor roses, simulating fireworks in honor of the Queen’s landmark birthday. 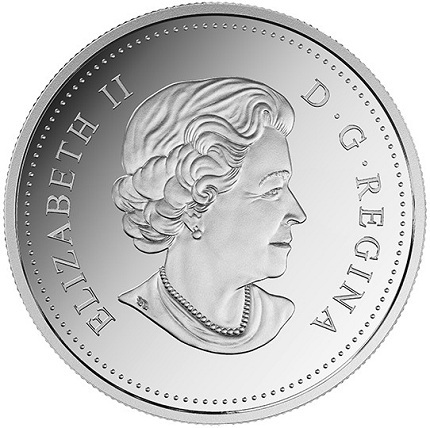 The obverse includes the effigy of Queen Elizabeth II created by artist Susanna Blunt, which has been used on all Canadian circulation coins and many collector issues since 2003. For more information on this and other coins on offer from the Royal Canadian Mint, please visit their Web site. 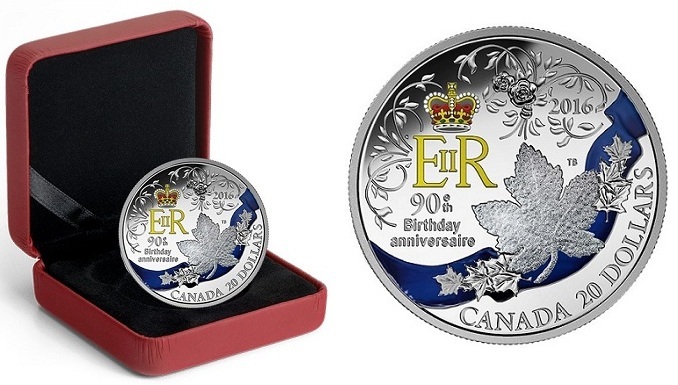 Note: Although the coin may still be available for purchase at Royal Canadian Mint retail shop locations, the product page on the Mint’s Web site shows that the item is already sold out. Independent vendors on sites such as eBay are currently offering the coin for $100 to $200.